"I was first introduced to Ted and ShopBot when I bought a copy of Ted's BtDzn software. Included with the software was information on a low-cost CNC tool that Ted was working on. I kept in touch, went to Durham a year or so later to see a working version, and signed up on the spot. A couple of months later I took delivery of ShopBot #2 ( or #3, nobody's really sure). 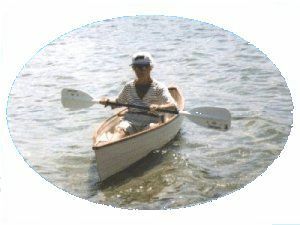 One of the things that Ted asked me to do with my new ShopBot was to build a small canoe for his mother-in-law to use on their annual family trip to Michigan. This project contains complete instructions for building a QuickLap Canoe with detailed pictures and all the ShopBot cutting files. The history of boatbuilding techniques and materials is fascinating to any woodworker. Includes the QuickLap ver2 files and instructions which have been updated to reflect feedback from several folks, especially ShopBotter and boatbuilder Bill Palumbo. I've tried to make the instructions clearer and added a few graphics. A couple of modifications have also been made to the cutting files - the addition of rivet holes in the second set of panels and a fine-tuning of one of the plank edges. As several folks have shown an interest in building one out in Luaun before they cut into Occume, I've also added instructions and a scarf joint for building the canoe out of Luaun. In my opinion there are some serious problems with using Luaun and I can't really recommend it. But I can understand wanting to try it out and have made some suggestions that hopefully will help. This Project file and its design are Copyright property of Bill Young and ShopBot Tools, Inc. They are made available to you here for your private use. To use or sell these projects or any components of them commercially, a license must be obtained from ShopBot Tools. Licenses are available for a reasonable fee.